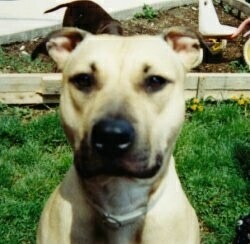 Chica the American Pit Bull Terrier at 5 years old—"Chica was my first actual Pit Bull to own. I had helped raise several before her but she was the first one that I ever called mine. I had gotten her from a well-known breeder and she is certified through the CKC. For the first couple years of her life it was just her, me and her dad (who is now my ex-husband). She was very easy for me to train (she even knows right from left), always full of energy and eager for all the attention. Eventually we moved to the country where she even learned how to round up the cattle. We ended up having a baby girl in 2005 around Christmas time and I was a bit nervous because chica had never been around babies or children before. Needless to say she has been the BEST dog ever for my little girl. Working as a veterinary technician I get asked a lot about what pets I own and, even though I sometimes receive judgmental looks, I proudly tell others that I own Pit Bulls (currently I have two, did have three but one passed away due to illness) and always brag on what great family pets they are. 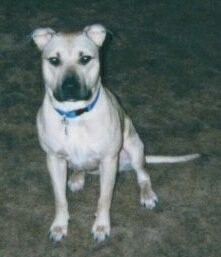 One day I hope to have my own Pit Bull rescue and continue the fight for the good name of this wonderful breed." 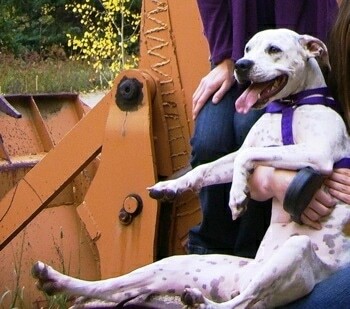 "Lucy is a four-year-old, approximately 65-lb. 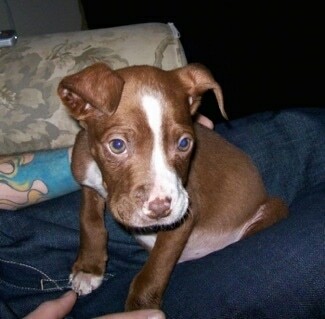 Pit Bull that was rescued by my boyfriend over a year ago. She is very calm and submissive, good with kids and other animals when she gets to meet them, and sticks by us when we walk her without a leash through the woods. She loves taking naps in between walks and cuddling with anyone who sits next to her on the couch. She lives with a two-year-old Beagle named Gunner." "Lucy's big smile. 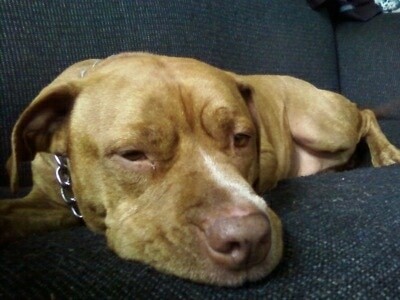 Unfortunately, a lot of people get scared by Lucy because she's a Pit Bull. She has never showed signs of aggression towards anyone, and yet people cross to the other side of the street when they see her coming. 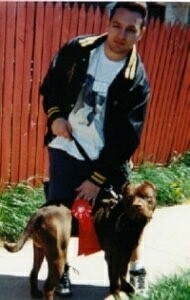 It's because there's too many people, at least here in Pittsburgh, that get scared of Pit Bulls because they look tough, can be trained to fight, and to make money off of breeding and selling them on the streets. Also, there are too many Pit Bull owners that don't educate themselves about how to train a powerful breed dog and become its pack leader. 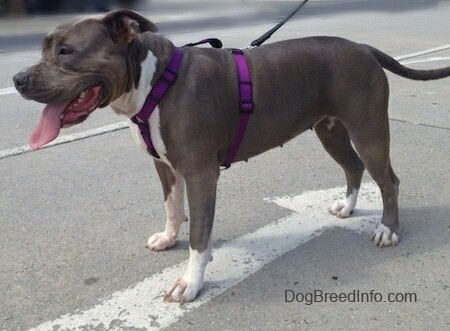 Any dog that does not have a stable pack leader, Pit Bull included, will attack if it's raised in an aggressive environment. 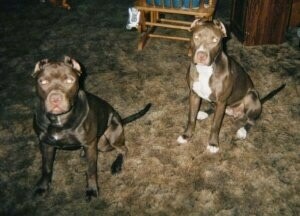 They're loyal dogs that just want to please their owner, and sadly that's how they got their bad name." 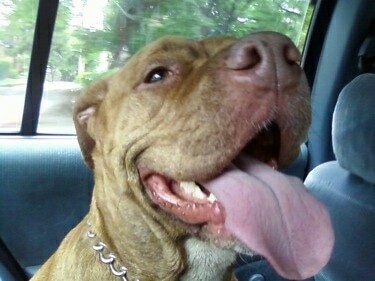 "This is Maria, my 1 ½-year-old Pit Bull. She is an amazing dog whose personality, loving spirit and big smile has changed my life, and the perspectives of many people of Pit Bulls! She loves to snuggle, and is by far the most loyal and affectionate dog I have ever owned—always wanting to be by your side or under the covers with you! She has crazy energy and loves to play, wrestle and go on long adventure walks. When I first got her, her personality seemed overwhelming (as I'm sure many people experience with a wide variety of pups). We took her to the Canine Counselor who uses the same training system as Cesar Millan and it has not only made her a better dog, it has made me the best owner I can be! 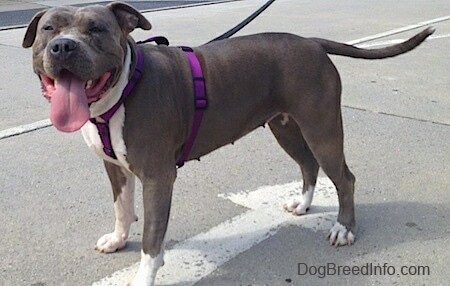 Many cities around us are beginning to outlaw Pit Bulls, and having one and understanding the amazing capabilities of this breed, as well as wonderful companionship, I must say that it is essential to let people know that breed banning does not fix the bad behavior of the humans that have brought the bad name to their dogs. 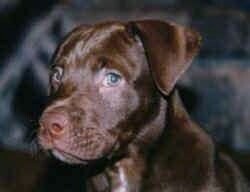 No matter what breed type one owns, it is the responsibility of the owner to train a dog. So many amazing dogs have died because of human inability to own up to their own imperfections. 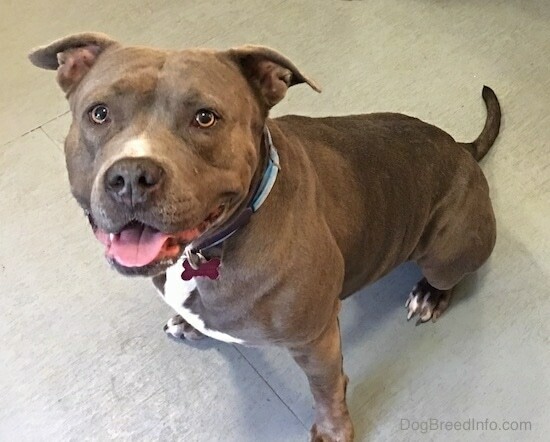 Maria is an excellent case of a dog that has broken out and excelled beyond petty stereotypes of her breed, and I hope that people will begin to see how truly amazing and loving these dogs really are." "This is Java, a 2-year-old American Pit Bull Terrier proving the nature of the APBT with a smile after my 4-year-old daughter finished dressing him in a tutu and sweater while I was in the shower. This dog is loyal, intelligent and a cuddly clown! 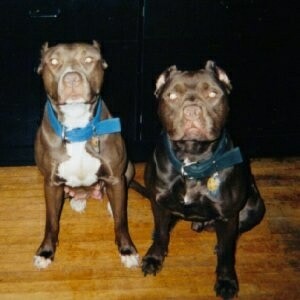 I have worked with many breeds and never will I be without a Pit Bull!" 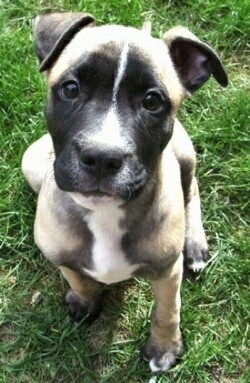 "This is my American Pit puppy Bandit. He's about 2 months now and is wonderful. 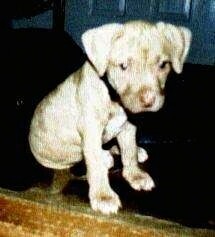 I've never had a Pit Bull before and when I saw him I just had to have him. He is very well tempered and very smart. My dad is paralyzed from the neck down and he is very kind and calm around him. He loves Lilly the Golden Retriever. I wouldn't give him up for anything. 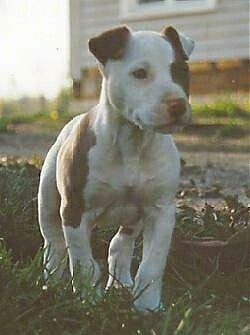 I LOVE MY AMERICAN PIT BULL!!!" American Pit Bull Terrier named Rossco—His owner says, "This is the best dog I have ever had, and we have so much fun together!" 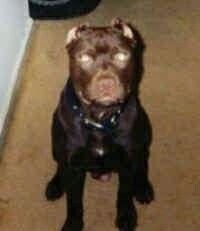 This is Bullet after his ears were cropped, photos courtesy of John Errington. 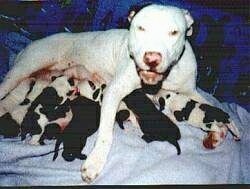 Miss Primus the white Pit Bull Terrier and her 8 puppies! 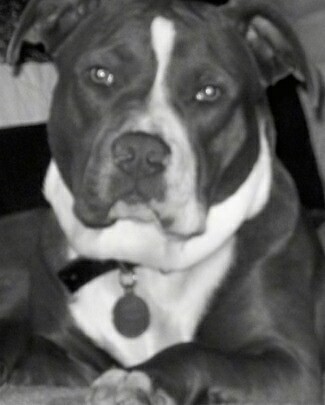 "This is Ronin, the love of my life. My husband and I rescued him from an environment that would have surely killed him. In the first picture, he was 2 months old and barely weighed anything. You could see almost every bone in his body and he had a pop belly from being so malnourished. I didn't think he was going to make it a week." "But, just a little over a year later and look at him now. This dog is the most beautiful creature I have ever had the pleasure of being around. There is not a day that goes by that I don't look at him and feel so full of love and appreciation for him. We had 2 other Pitbulls now and I have noticed that these dogs are so affectionate, more than any other dog I have ever been around. All they want to do is be right there with you, 24/7. I can't even begin to tell you how much I love my Pitbulls, and I'm sure that anyone else who's ever been around them or owned one understands just what I mean when I say that. 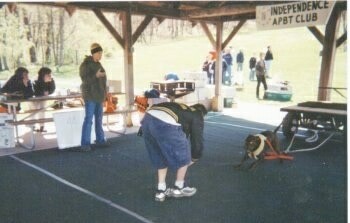 I will always be an advocate for these dogs. With the right kind of leadership and attention, there is no reason you should ever hear the horror stories that you do about Pitbull attacks. 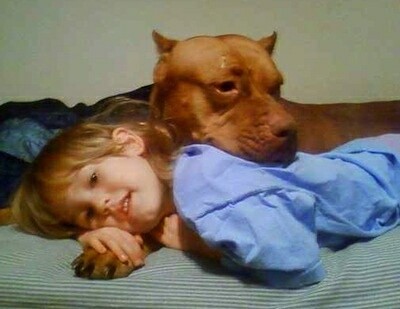 People have to understand that these dogs love you so much that they will die fighting to protect you."